Size is an important consideration. The size chart for different manufacturers will be different. For instance, the size 7 from two different manufacturers will have different length and breadth. So, ask for a size chart from your online seller and ask them to provide with a guide that you can probably use to measure your feet and compare it against the size chart they provided. Of course you will never want smaller or bigger shoes. 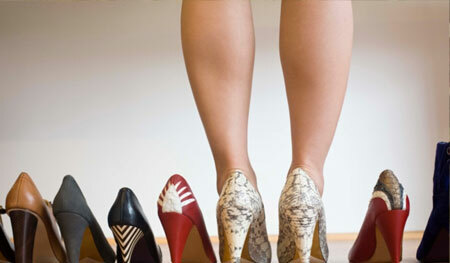 Find out if the online seller is providing details about the pair of shoes you are looking at. The more information they provide about the cutting, heel size, material used, colors available, the better it is. Also make sure that there are ample photos provided from different angles so that you can get a feel of 360 degree view of the shoes. If you have any questions or you need any additional information, ask the online seller. You can use the contact details and send your queries. Never forget to take a look at the comments left by the previous purchases (if at all the shoes you are eyeing at have been purchased by others). You can really get some useful information out there. Of course there will be some negative comments but if the number of positive comments are more, you can go for it. Ask your online seller about the refund or return policies in case you find that the pair of shoes you bought are not fitting properly or there is a color mismatch or perhaps the design is different. This happens frequently in case of online purchase. Finally never get satisfied with one seller. Women are great when it comes to window shopping. Look around for some time and look at alternatives. There is no harm in doing so. Compare the prices offered by different sellers. Different sellers can indeed have different prices. You may also see that post-sale services may differ significantly between different sellers. The best way to judge the customer services of the sellers before you buy your pair of shoes is to look at the comments.